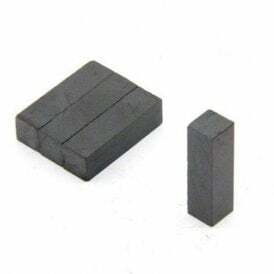 A selection of neodymium and ferrite magnets measuring 7mm in diameter (for disc/sphere magnets) or 7mm wide/long (for rectangular magnets). Small neodymium or ferrite magnets can be fixed in place using adhesive or can be pushed into drilled holes or grooves in wood or plastic. Many new packaging designs use magnets cleverly trapped behind laminations of cardboard to provide invisible closing mechanisms for folders, gift boxes, name badges and even greetings cards that stick to your refrigerator! Also in this section, the instantly recognisable small horseshoe magnet; great for teaching children about physics and for fun science projects.